The good news is the bible does have something to say about eating meat. It is true that anemia is a common health problem. Contrary to popular opinion, when it comes to protein, more is not better. It is true that high doses of protein will promote larger muscles, but the side effects are not worth it. The risk of death from a heart attack is 50 percent for the average American man; when reducing meat intake, the percentage drops to 15 percent. A human’s digestive system is not genetically designed for a high meat diet. If you are a heavy meat eater, your body will be so contaminated with toxins you would not pass the FDA’s standards to be sold for human consumption. It didn't take long for me to learn how to navigate between healthy and unhealthy carbohydrates, fats and oils. The nutritional line was clear. What I did find a challenge was sorting through the controversy protein finds itself in. Here, the line was not as clear. As a casual bodybuilder, finding a healthy source of protein was confusing. Even the beloved soy bean comes with its own set of controversies. As well, protein raises ethical and religious issues. A sweet cinnamon Danish can be enjoyed by all persuasions, but a slap of cooked animal is no longer politically correct in some circles. Moral complexities notwithstanding, of the three macronutrients, protein is the most multifaceted in nature. It is within protein that we find an organism’s biological identity—kind of like a chemical fingerprint of what makes up the physical you. The immune system pays close attention to this fingerprint so it can determine a foreign invader like a cold virus or anything else that is not a part of the biological family that makes up your body. If it does not pass the fingerprint test it will be quickly expelled by the immune police. 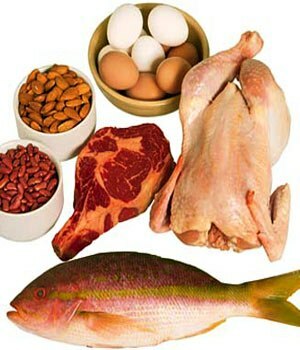 There are ten essential amino acids needed for the body to manufacture protein. Any time you see the word essential it means the body cannot produce them internally, and therefore they must be supplied by what you eat. Protein is used to build and repair tissue, form blood cells and make antibodies to protect us from illness and infections. Excess protein not used for growth becomes fuel that the body burns for energy. This is why protein is included in the macronutrient family; protein can be burned as human energy like carbohydrates and fat. But unlike carbohydrate and fat, which are clean burning and able to break down into simple water and carbon dioxide, the byproduct of the metabolic combustion of protein is ammonia. If you have smelled ammonia you know it is not a desirable substance to have floating around in our blood. It is a toxic by-product the liver must convert to urea. Urea, a less toxic waste product, must then be removed from the bloodstream, which falls on the work of the kidneys. This means a diet high in protein results in an increased workload on the liver and kidneys and other sensitive organs exposed to toxic metabolic wastes. A high protein diet has other undesirable side effects like premature aging. It makes sense not to overeat protein, but rather to eat just enough to maintain a healthy body. Of the three macronutrients, protein not only burns the dirtiest, but often comes from the dirtiest foods we commonly eat, like meat. So the two questions are, how much protein intake do we really need to be healthy and what are the cleanest sources of protein. Answering these two questions will result in noticeably improved health. Related Articles: Is Meat Healthy?